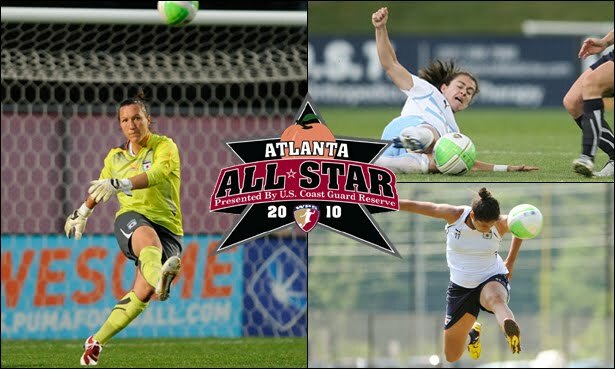 KENNESAW, Ga. -- All three Chicago Red Stars participants played the bulk of the second half during the 2010 WPS All-Star Game presented by U.S. Coast Guard Reserve on Wednesday night at KSU Soccer Stadium. Marta XI defeated Abby XI, 5-2, as this year's WPS All-Star Game included a head-to-head matchup of WPS players captained by the Washington Freedom's Abby Wambach (Abby IX) and FC Gold Pride's Marta (Marta IX). Red Stars forward Cristiane entered Wednesday's match for the Boston Breakers' Alex Scott at the start of the second half for Marta IX as the squad brought in five reserves. Cristiane is the Red Stars' only two-time All-Star. She started for the WPS All-Stars last year during WPS's 4-2 victory over Sweden's Umea IK on Aug. 30, 2009, in Fenton, Mo. Chicago midfielder Karen Carney entered the match for the Breakers' Lauren Cheney in the 51st minute for Abby IX. And in the 55th minute, Red Stars goalkeeper Jillian Loyden replaced Atlanta Beat goalkeeper Hope Solo for Abby IX. Read the full post at ChicagoRedStars.com. BRIDGEVIEW, Ill. -- The Chicago Fire's Lamar Hunt U.S. Open Cup third-round match on Tuesday was a mess in more ways than one. The few passing moments in the offensive third, the petty extracurriculars between the Fire and United Soccer League Second Division opponent Charleston Battery, the two scoreless 15-minute overtimes, the questionable officiating decisions -- these elements dragged out an uneventful feeling within the match. Chicago's lackluster effort resulted in a 3-0 loss in penalty kicks as Charleston advanced to the Cup quarterfinals in front of 2,526 at Toyota Park. Charleston next plays Major League Soccer's Columbus Crew. The Crew defeated the D2 Pro's Rochester Rhinos, 2-1, on Tuesday night. "I don't have anything to complain [about] to our players. They tried the whole match to win," Fire head coach Carlos de los Cobos said. "But we missed some options. We weren't effective." BRIDGEVIEW, Ill. -- What a difference a year makes for Chicago Red Stars goalkeeper Jillian Loyden. Last season, the Vineland, N.J., native played second fiddle to U.S. Women's National Team starting goalkeeper and former Saint Louis Athletica starter Hope Solo. Loyden had a few opportunities in the net during the inaugural 2009 Women's Professional Soccer campaign, including a shutout against the Red Stars. But she was not a part of the regular week-to-week spotlight. "I think it was the best environment possible to learn, grow and develop as a goalkeeper," Loyden said. "It helped me transition a bit better having that experience under my belt, although I think I am still adjusting and still have a lot of work to do." Everything changed this season with the Red Stars, and now Loyden is representing the team at this Wednesday's 2010 WPS All-Star Game presented by U.S. Coast Guard Reserve. "I was definitely shocked and surprised," Loyden said of her inclusion. "There are so many talented players in this league, and to be chosen is an honor. It should be a lot of fun to play with my Red Stars teammates and my teammates of the past." 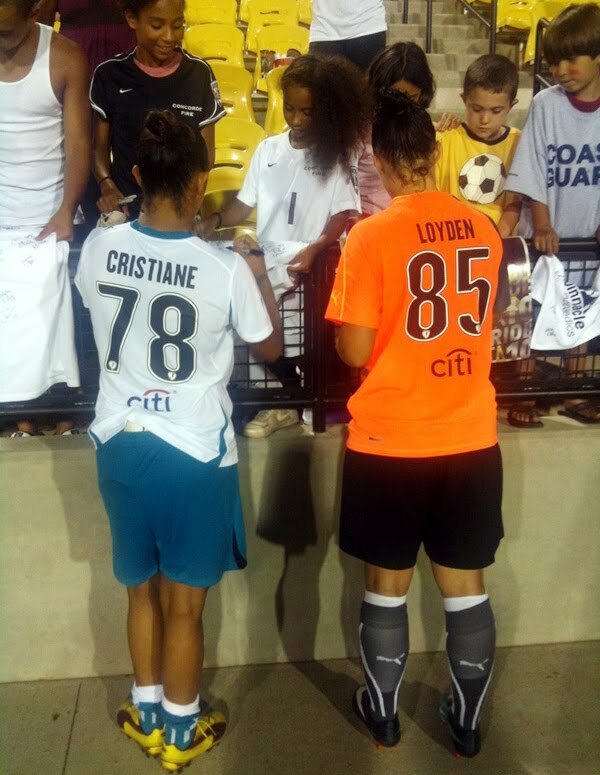 Loyden, midfielder Karen Carney and forward Cristiane represent the Red Stars for the WPS All-Star Game, which takes place at 7 p.m. CT Wednesday, June 30, at KSU Soccer Stadium in Kennesaw, Ga. The match is televised on Fox Soccer Channel, and preview coverage starts at 6:30 p.m.
BRIDGEVIEW, Ill. -- Chicago Fire target forward and Arlington Heights, Ill., native Brian McBride and midfielder Patrick Nyarko have some added interest in the 2010 FIFA World Cup when the U.S. takes on Ghana this Saturday. 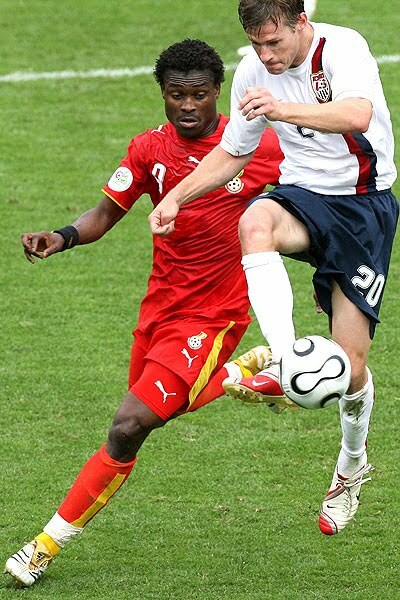 McBride was on the 2006 U.S. squad that fell to Ghana, 2-1, and was eliminated from the Cup. He played in the full match and had a diving header that hit the post. Nyarko is a native of Ghana, and he knows he is in the minority among the fandom surrounding him in the Fire clubhouse. "I'm remaining quiet right now because there are a lot of Americans in the locker room," Nyarko said. "I'm not talking that much. Come Saturday ... I don't know if we're going to watch it either because we're traveling. But I'll be cheering for Ghana." McBride was on the wrong end of the last World Cup result against Ghana, but this year's rematch is much different. Both teams have advanced past the group stage, with the U.S. winning Group C and Ghana taking the runner-up position behind Germany in Group D.
"When you play in an elimination round, anything can happen," McBride said. "So you have that extra bit of excitement. I think there's a bit more tension, knowing that every possible mistake you could make could affect the outcome. It gets you more focused, and you get more excited because of the possibilities." Emotions built as the clock ticked away Wednesday during the United States' final Group C match against Algeria in the 2010 FIFA World Cup. Which way would the tide flow for the U.S.? Would the Americans fall short once again from advancing through the group stage, or could they pull off the miracle goal? In the 91st minute, the U.S. found that long-awaited clutch strike as Landon Donovan's second-half stoppage time goal carried the Americans to a 1-0 victory over Algeria and first place in Group C.
"It's a match where both teams need to win, so it turns into a very wide open game," former Chicago Fire and current U.S. head coach Bob Bradley said in the postmatch news conference. "Algeria is a very good team, skillful and well-organized, but the game now takes on a different tone just because of the need for both teams to win." Read the full story at ESPNChicago.com.